Envision² Compact products offer industry-leading efficiencies in a much smaller footprint. 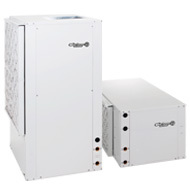 The compact cabinet makes this heat pump system the perfect solution for commercial retrofit and boiler/tower applications. Available in a wide selection of capacities (5-17kW), the Envision² Compact carries many of our most advanced features — including the Aurora generation of controls. Options include a factory-installed 24V motorized on/off water valve option for VFD pumping with automatic internal water flow control; hot gas bypass and reheat; and high-efficiency PSC, X13, or variable speed ECM motors to fit your efficiency and comfort needs. Envision² Compact units exceed ASHRAE 90.1 efficiencies and utilize environmentally friendly R410A refrigerant.